March is Women’s History Month, and a topic for this month’s Carnival of Genealogy (CoG) is to write about a female relative. Thanks especially to Jasia at Creative Gene for hosting the CoG. Regular readers of this blog have met Elisabetha (Lisi) Ebner, my paternal grandmother. This CoG gives me an opportunity to introduce you to my mother’s mother, Alöisia Koroschetz, née Woschkeruscha (VAUSH-ker-UZH-uh). (She was nicknamed Luisa -- or Louise, in America. My middle name is taken from her). She was born May 4, 1886, in Wiener-Neudorf, Austria, south of Vienna, to Johann and Therese Woschkeruscha. 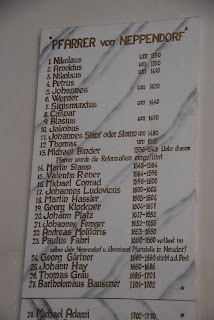 We don’t know much about Johann’s forefather’s, but Therese was the daughter of Anna and Paul Müller (Miller). Paul’s surname was also his profession. He owned and operated a successful flour mill, which will be the subject a future post. 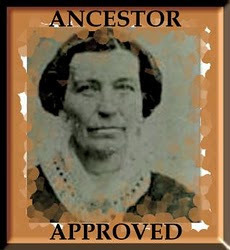 From family lore, I learned that as a young child, Alöisia and her sister had contracted smallpox. Her father supposedly ran through the night to get a doctor when his little girls were burning up with fever. My mother told me the little sister died. Alöisia lived, but her face had been disfigured with pock scars, making her self-conscious of her appearance throughout her life. While her photos show her to be dramatically good-looking, we can’t see the pits that made her feel she was ugly. Later in life, she felt compelled to have acid applied to her face to smooth out her ravaged skin. But it couldn’t smooth out her psyche. My mom said she was convinced no man would ever fall in love with her because of the scars, and, that may have influenced Alöisia to pursue a career. Nevertheless, her artistic skills were undeniable. She was “a graduated dressmaker from Vienna,” a mantra she repeated over and over to my mother, Lillian, and which Mom, in turn, repeated to us children. In an era when virtually every girl was required to learn all manner of needlework, there’s no doubt that Alöisia had exceptional talent. I have framed two samplers she made when she was quite young. We can see her initials and the date (AW - 1897) on this embroidery sampler she created at the age of eleven. Eleven! I haven’t seen enough samplers that other eleven-year-old girls created as a comparison, but I find the perfection in every detail simply amazing. 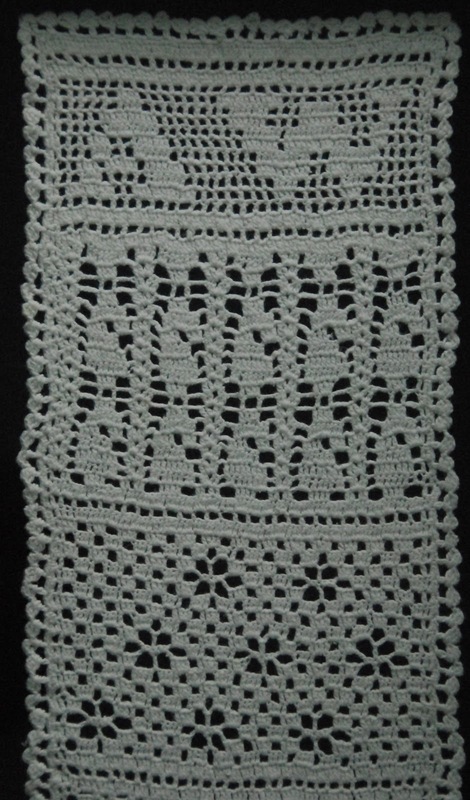 The other is a sampler of various crochet stitches. Again we can see her initials, but this beautiful forty-two-inch-long stretch of eleven different crochet stitches has no date. At an early age, her talents were visible--and she decided to pursue her gifts beyond just home and hearth. She wanted to have a profession, and that put her ahead of her time. 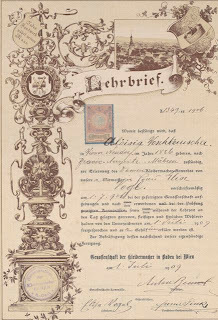 Among our family documents is her Lehrbrief, which translates to "Apprentice Certificate," proof that she has completed her apprenticeship, which she began three years earlier, July 1, 1906. It comes from the “Association of Clothing Manufacturers in Baden near Vienna” declaring Alöisia “competent to make women’s clothing,” and praising her as "true, industrious, and morally upright!" It’s dated July 1, 1909, and the Lehrbrief is a work of art in itself. As we move around the document, all sorts of cool details emerge. 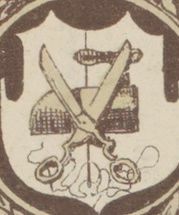 At the left of the document are symbols of the dressmaking profession: scissors, thread, and an iron. Near the top are a thimble and needle. My favorite is in the upper right. 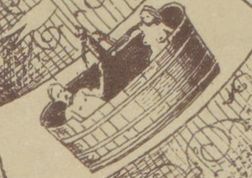 As we zoom in we can see a drawing of a naked man and woman in a large wooden tub--a seeming precursor to the hot tub! Did someone just slip that in as a joke or does it symbolize the importance of the dressmaker to keep the public decent? Check out the photographic details at the end of the post. Alöisia had to complete a “Master Work.” The photo at the top is Alöisia posing in the dress she designed and created to get her degree. The photo is dated 1912, so six years passed from the time she began her studies to the date of this photo. It may be hard to see the detail on this blog post, but the dress is stunning. The skirt is splashed with pearls, small satin bows run vertically down the chest, and tiny rosettes edge the high collar. It had always rankled her that she walked away with only second prize, knowing her creation was the finest in the class. Of course, the mayor’s daughter had to take first. 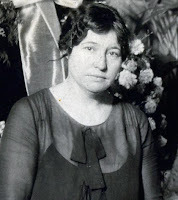 Maybe that kind of favoritism made her decide she’d be better off finding work across the ocean--because a year after her “master piece” picture was taken, in 1913, she wrote a letter back home to her dress-making teacher, named on the above Lehrbrief--Frau Vogl, about her new job in America. Unlike Lisi, she had no man waiting to marry her. She had set out to make it on her own. Naked man and woman in "hot tub"
upper right detail in Lehrbrief! After my brothers and I read the summarized history of the Gärtz (originally Gerz or Görz) family handed to us by the church secretary, Renate, when we visited my grandfather's church in his hometown of Neppendorf, Romania, we discovered the following highlights. Perhaps some may ring true for your family as well. One generation after another named the first-born son in the family Michael. I’ll distinguish them with a birth year before the name. First-born girls were typically named after their mothers. The first (1771) Michael Gerz and his wife, Elisabeth, had seven children, including a Katarina born in 1807. This Katarina had an illegitimate child. According to the research, Katarina's church pastor “disciplined” her, whatever that meant. Makes me think of The Scarlet Letter. 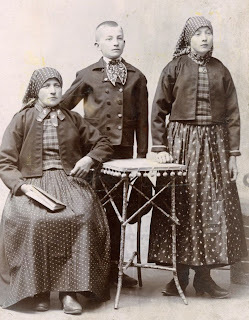 I wonder if the father of this “unehelicher Knabe” (boy out of wedlock) was “disciplined?” Hmmm. What do you think? In 1852, at age eighty-one, 1771-Michael Gerz and his wife were forgiven a “loan” because of “old age and poverty.” Do we do that today? It makes me sad to think that he immigrated to Neppendorf to have a better life, yet clearly didn't make it. of Gartz family home, Neppendorf. The 1802-Michael, yet another carpenter and son of the poverty-stricken couple above, froze to death when he was 58 years old. No details, but at least he didn’t die before he could name his first-born son…you guessed it...Michael--whom we’ll call 1829-Michael -- very important because he’s the direct link to my grandfather, Josef, and present-day cousins. 1829-Michael was a linen weaver, who married Maria Hutter (pronounced “Hooter.” Now don’t laugh!). According to my cousin, Maria, this 1829-Michael is credited with building the Gärtz home in Neppendorf (right), in which generations of Gärtzes lived, including my grandfather, until he emigrated, and Maria's family through the 1980s. We all made a pilgrimage there after our visit to the church and took this picture. We'd come 5,000 miles and now stood where perhaps Josef had stood, bidding farewell to his mother and sister in 1910, never to see them again. 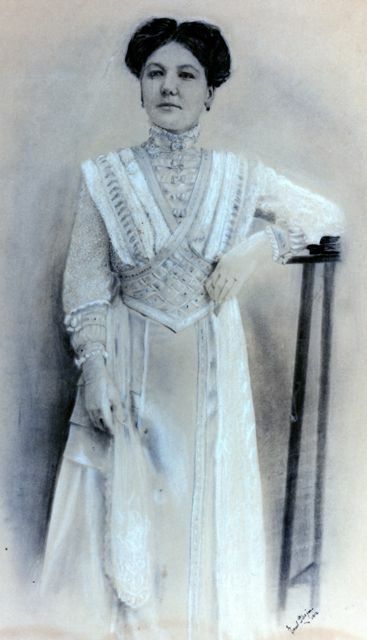 One of the four living children of 1829 Michael and Maria was yet another Michael -- born in 1867. (Keeping track of ancestors sure gets complicated when everyone has the same names!) We have no photo of 1829-Michael, but we do have this photo of his son, 1867-Michael. Cousin Maria gave it to me because he's her great-grandfather. 1829 Michael is therefore Maria's great-great grandfather. But he's only my great grandfather, even though Maria and I are about the same age. Here's why and how the family generations got skewed. his mother and sister in next photo. 1829-Michael’s first wife, Maria Hutter, died in 1883 (age 55). Wasting no time, widower Michael remarried a year later to Katarina Schnell, my grandfather’s mother. She was only thirty-three when she married fifty-five-year old 1829 Michael. I wonder if marrying someone who could be your daughter’s age was a sort of “trophy wife” of the day. 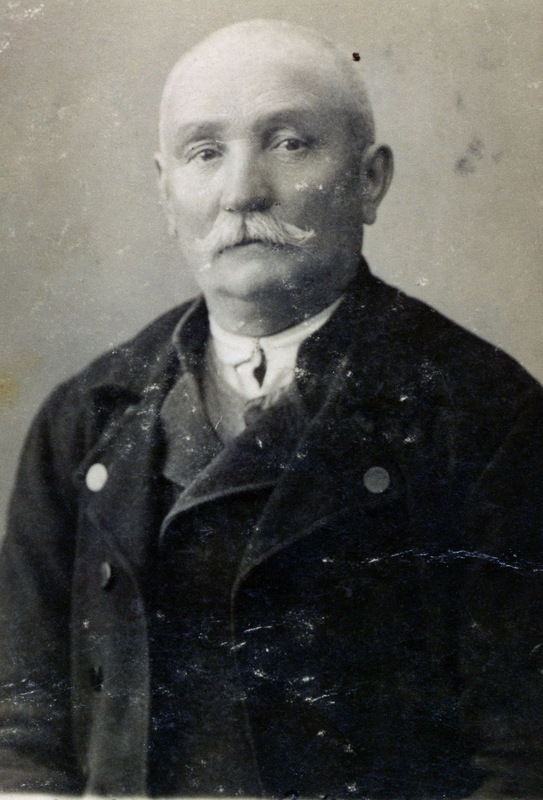 Their first living child (the first daughter died as a baby) was daughter, Katarina (note, same name as her mom-the naming tradition), born in 1887; and then in 1889, my grandfather, Josef Gärtz, was born. His half brother, 1867-Michael, pictured at left was a full twenty-two years older. Age-wise, he could have been Josef’s father, and family lore holds that’s sort of what he became. When Josef was a mere four years old, his father died. That's why this family photo of Josef's mom, him, and his sister, Katarina, has no dad posing with them. 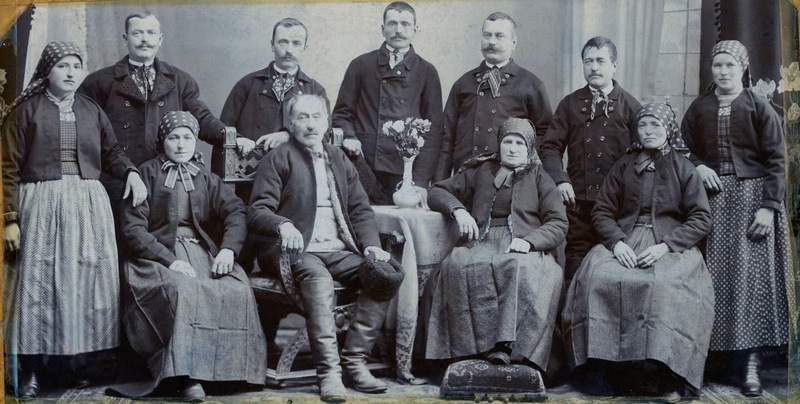 Cousin Maria tells me that half-brother, 1867-Michael, moved into the Gärtz home with his wife Sara, and helped raise little Josef. It couldn't have been easy with two women in one household. I'd find out more about them in the most unexpected way. But first, some truly astounding discoveries in a small museum in the back of the Gärtz church, celebrating German life Neppendorf. When I tell friends or new acquaintances that my grandparents hailed from Transylvania, the Dracula jokes start flying (“Well, I guess I’ll watch my neck” or “Good Bloodlines,” and so on). For those who don’t know how the Dracula legend got started, I thought I’d give you a thumbnail sketch. The real Dracula (upon whom it is believed that Bram Stoker derived at least the moniker for his novel’s main character) was a fearsome leader who literally made people’s blood run--and whose name alone made the blood run cold. He became "Prince of Wallachia," so a bit about that centuries' old principality is in order. Wallachia (in yellow) around 1390. 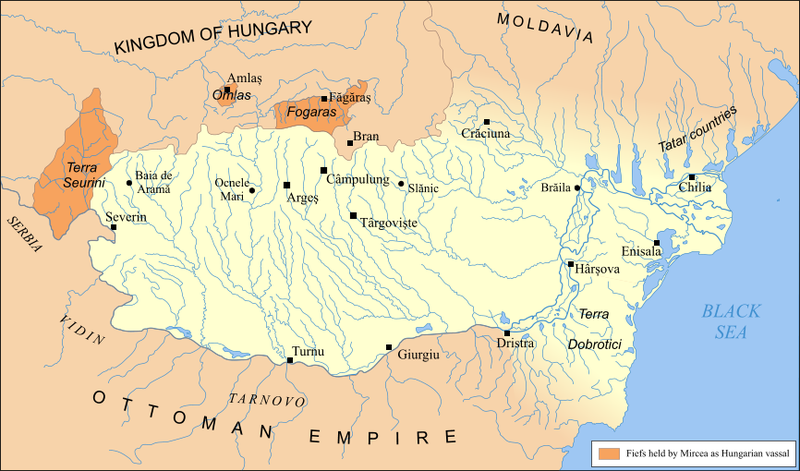 Note "Kingdom of Hungary" to the north. Ottoman Empire directly south. 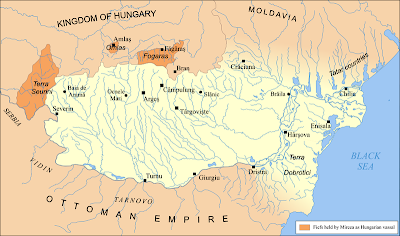 Wallachia was originally founded in about 1290, but taken over by the Ottoman Empire in the early 15th century. Wallachia was just south of present day Romania. 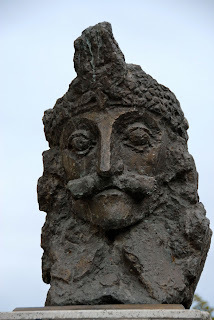 Vlad Drăculea III (sometimes spelled Drakulye, meaning “son of the dragon”) was born in 1431 in Sighişoara (SIG ee SHWOR uh), called Schässburg by the Germans. It is one of the seven walled cities in Transylvania that give the area its German name, Siebenbürgen (seven fortresses). In 1436 Vlad III’s dad, Vlad II, was made ruler of Wallachia, but was ousted just six years later in 1442 by rivals with Hungarian backing. Vlad II persuaded the Ottoman Empire to support him in getting back his throne, but they agreed only on the condition he give them two sons, including Vlad II, as hostages to ensure he would stay loyal. Vlad II was imprisoned, beaten, and whipped, and God knows what else by the Ottomans, ensuring his enduring hatred of them. Vlad, the dad, was killed in 1447, and in 1456, Vlad, the lad (now age 25), reconquered his native land of Wallachia, which he found in economic ruin. He created laws to renew trade, help merchants and peasants, and imposed harsh punishments for thieves and robbers (the adjective “Draconian” might be used, but “Vladian” seems more appropriate). My ancestors had not yet arrived in Transylvania when Vlad was ruler, and a good thing too. Because Vlad thought the Transylvanian Germans had helped to bring about Wallachia’s ruin, he raided their cities and impaled several Saxons in Kronstadt. admired for fighting off the Turks. Vlad was a “take no prisoners” sort of ruler. If anyone broke his laws--men, women, children--punishment was the same. He instigated war with the Ottomans by nailing the turbans of some Turkish envoys to their heads because they wouldn’t “remove their hats” in his presence. That got their attention. Sure enough, the Ottomans invaded, but Vlad ambushed them and skewered all that didn’t die in the fighting. He was superb at psychological warfare, once staking 20,000 people of all ages around his home town to freak out invading Ottoman forces. It worked. They turned back. A woodcut from the era shows Vlad dining while surrounded by his impaled victims. I want this to be a family friendly site, so this post won’t get into the grisly details. If you want to learn more, click on one of the links. Needless to say, the real “Dracula” was a far more fearsome creature than the one Bram Stoker devised, and I’m just glad my forebears waited a couple of centuries before emigrating from Germany to Transylvania. Part of the fun of genealogy is imagining what our ancestors’ lives were like. I wouldn’t want to imagine them living under the rule of Vlad Tepeş. This little Valentine has no date and no signature. So I had put it aside, only to rediscover it just last week! I was able to read the strange writing better after a year of practice, and when I translated the sweet greeting in the first part, I realized it was a century-old Valentine. I scanned it and immediately sent to my "Rosetta Stone" in Germany to decipher the parts I couldn't read. Now I've got it! I’ve deduced it was included in the January 29th letter that Josef Gartz (my grandfather) wrote to Lisi Ebner (my grandmother), along with Frau Beer’s note. (See previous post, Love Finds a Way,) because Lisi begins her letter with a response to the Valentine note -- as well as a veiled reference to her annoyance with hearing from Frau Beer. On Saturday at 3:00 pm, February 11th, I received the two letters, the 2nd from E[va]. You write to me that I alone should read your writing. That no other person should see it. I am entirely alone, and will be for the time being. Laughing and talking are in the past. But oh how I smiled when I heard...how satisfied and happy you are. What joy I felt! Today I was at home where I occupied myself with thoughts of you, rested and didn’t do a lot. I fantasized about your letter, how you explained your trip, and I wondered if it’s only a short time until my path is free [to come to you?] Now I just don’t know what I should do. It’s clear to me and eases my mind that our dear God turns our destiny, at times giving us sadness and heavy burdens, but then again makes the sun shine. I believe that more opportunities arise over there [America] and it would be better than here. Also our dear God gives you the chance to reach your desires. I thought to myself that you would stay there one year (or two years at the most). Perhaps you would have enough earnings that you would come and get me. Then I would leave immediately and have no fear at all, no lack of courage, because I would leave with [you and] your protection. How I would go there myself I don’t know. The signature is missing, but my guess is it was signed "with Greetings and Kisses." I can imagine Lisi’s trepidation at the idea of undertaking the arduous, frightening journey to America alone. She hopes Josef will come to get her after a year or two. Naturally, she would feel safer traveling with him. But he had already left his home town once without proper papers, and knowing his impatient and determined nature, he won't want to wait a year or two for his love to join him. I'll be sharing future postcards and letters, each of which contains an amazing discovery or coincidence, and foreshadows their future together. 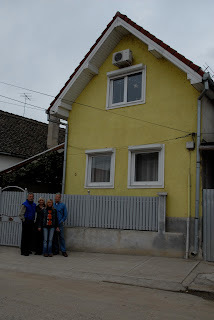 On February 11, 1911, the mail arrived in Hermannstadt, Hungary, where my grandmother, Lisi Ebner, worked for Mrs. Jickeli. I can imagine Lisi’s heart quickening when she saw a letter postmarked Cleveland, Ohio. Except for a brief postcard from New York, she hadn’t heard from her sweetheart, Josef, since December 30th--more than a month earlier. So after she read how eager Josef was for her to come to America, to get all “legalities in order” so they could marry, I wonder how she reacted when she saw that he had also enclosed a letter from Eva Beer, the wife of the Neppendorfer man who helped him get settled in America. Even though I’m an unknown friend, I would like to send you a few lines. Please forgive me if I burden you with my writing. Then Eva Beer jumps right in with exhortations and advice. She extols Josef’s virtues to such an extent, it makes me wonder if he dictated it to her! I had to laugh. Now, dear friend, don’t spend a lot of time thinking about whether to come here or not. You will be very satisfied with Josef and make him feel good for your entire lives. He goes diligently to work and when he comes home in the evening, he puts everything in order so that his whole room sparkles. Sepp is an upstanding young man and you won’t find another like him. He earns very good money and also gets his food at work so he can save everything he earns. He’s already bought fine provisions and dishes/tableware, and everything is certainly gorgeous when one goes into his apartment. He would have been able to marry here already a few times, but he wants no one but his Lisi. I’m not sure how you would react to this letter, but I, for one, would not be happy with another woman telling me that she knows my sweetheart better than I! Nor to hear that he could have already married several times--in less than a month, even if true. Are the girls crawling over him? I mean, he was a handsome dude, but honestly! I am impressed, nevertheless, that a great-looking, twenty-one-year old man is so neat, orderly and focused. He does sound like a good catch! Here I come to an end and remain your unknown friend, Eva Beer. Many greetings to you, Lisi, and your sister and brother-in-law and all your friends. So how did Lisi react to this over-the-top letter? I know Josef didn’t actually write the Eva Beer letter, because the handwriting is distinctly different. Yet I wouldn't be surprised if he told Mrs. Beer how desperately he wanted Lisi to come here, influencing her glowing praise of him. As we’ve seen already, he was a very determined young man. 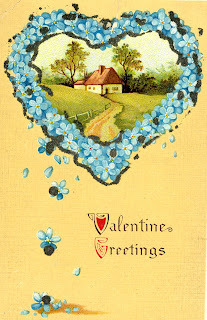 On Monday, February 14th, I’m going to share a sweet Valentine post card. 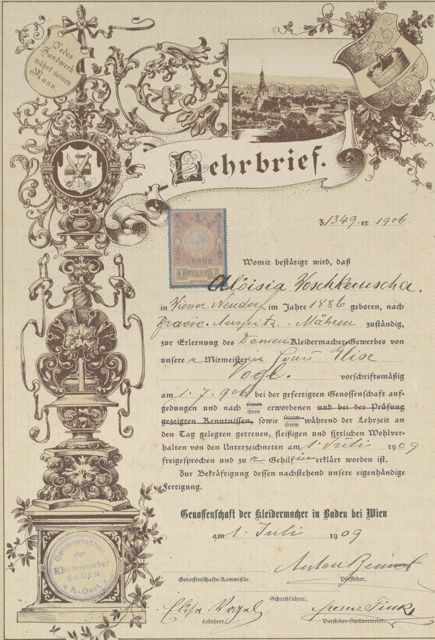 It’s neither dated nor signed, but the contents and Lisi's response, which she wrote immediately upon receiving his letter, indicate Josef must have sent it along with the letter shown here (which explains no signature)--to arrive in time to wish his sweetheart a happy Valentine's Day. We'll see how she reacted to his Valentine message as well as to Frau Beer's missive. 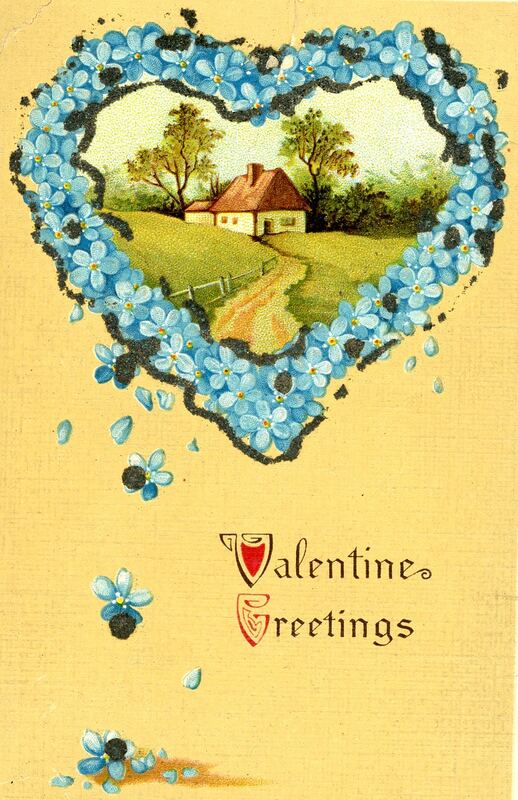 Think of love this upcoming Valentine’s Day by enjoying this vintage 100-year-old postcard. I had no inkling our family surname had ever been anything other than Gärtz. 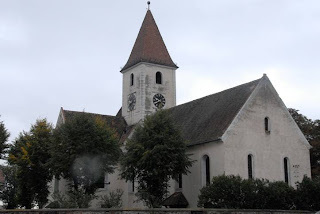 But then we visited my grandfather's home town church, the Evangelische Kirche Neppendorf, and met Renate, church secretary and Neppendorfer genealogy and history-maven supreme. She handed us a two-page document chronicling the highlights of Gärtz family history in Neppendorf, researched by an earlier church pastor. For the first time, we learned about our family's German roots in Alsace, and that our Ur-immigrant's name was not Gärtz, but Gerz or Görz. 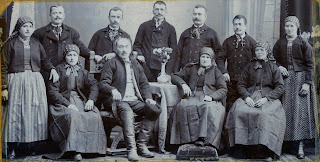 “All the residents of Neppendorf with the family name Gerz [this included Gärtz] originated with Michael Gerz/Görz, (1771-1856) [see correction below]* who came from Gerstheim on the Rhein [River] in Elsass (Alsace) in the French section of Niederrhein (lower Rhine)." *[8/22/2011 UPDATE: as I researched the family history further, I found out these dates were off. This "Johannes Michael Görtz" was actually born 10/10/1769 and brought to Siebenbürgen by his father in May, 1770. Details to come in a future post. My guess is that the spelling changed because the names sound so similar in German, they were simply recorded as heard. Eventually, after various iterations, the family became Gärtz. Gerstheim is about 14 miles (22.4 km) south of Strasbourg. We know that Alsace has been fought over by the Germans and French for centuries, so that part “in the French section” stood out. Did Michael leave because of trouble with the French? The French Revolution of 1789 affected Alsace when the French Revolutionary Army of the Rhine was victorious over Prussian/Austrian forces opposed to the new Republic, and tens of thousands (probably mostly ethnic Germans) fled east. Perhaps Michael was among them. We can’t be certain, but the timing makes it a tempting conclusion. We had also learned that the first Germans to emigrate to Transylvania back in the 12th century came from the area around Luxembourg, and other environs along the Mosel (German spelling) (Moselle) River (a tributary of the Rhein River), all in the vicinity of my ancestor's hometown of Gerstheim. The original Michael Gerz may have known he’d find people of a similar mindset in Neppendorf. He also had a transportable skill. He was a “Zimmermeister,” or “master carpenter,” like my grandfather, Josef. Not all churches have this level of detail available to family searchers seeking information on their ancestors, but it was a treasure trove for us, and I’d encourage anyone serious about family history to seek out a church your ancestors attended in the old country. No telling what you’ll find. 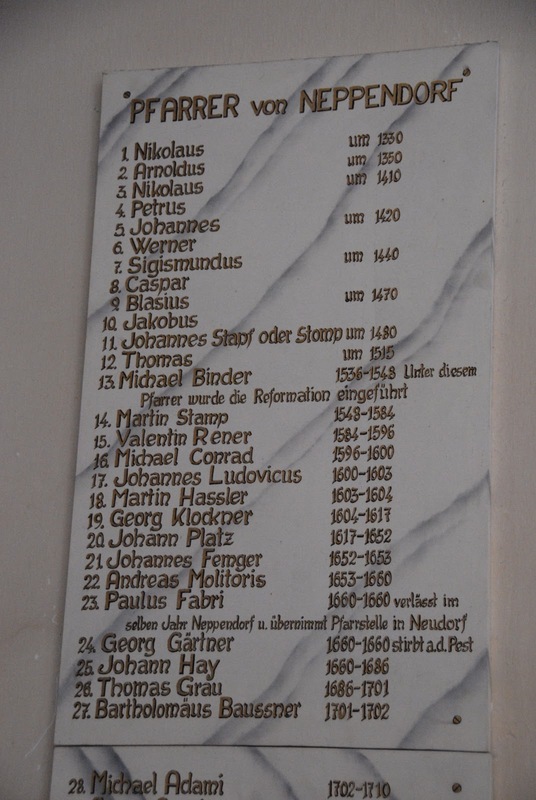 I breathed a sigh of relief when I learned the approximate date that the original Gärtz/Gerz/Görz had left Germany. 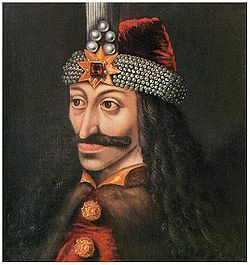 By waiting until the 18th century to emigrate, even if under circumstances of war, my ancestors had missed living in Transylvania under the reign of one of the region's cruelest rulers -- the man from whom the Dracula legend most likely originated. Dracul, aka, Vlad the Impaler -- up next Travel Tuesday. 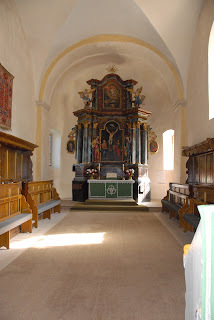 Then back to Josef's Neppendorf church as it spills more of its secrets. Friday, 2/11, Lisi receives Josef's January 29th letter, including the comments from Eva Beer, the wife of the Neppendorfer who helped him in Cleveland. How would you react if you were Lisi? No email. No texts. No chats. No tweets. No Facebook. By God! No telephone! So how does twenty-one-year old Josef Gärtz, my grandfather, persuade the love of his life, Lisi, merely twenty-two, to make a 5,000 mile trek to join him in America? A letter took about two weeks to travel from Cleveland, Ohio, the first city my grandfather lived in after arriving in America, to Hermannstadt/Sibiu, where Lisi worked in what is today Romania. That left plenty of time between communications for doubts and fears to creep into the mind of a young woman, to question the wisdom of taking on such a fearsome journey--alone. But we’ve already seen that Josef Gärtz was a single-minded man. When he wanted something badly (like getting to America), he let little stand in his way. (See previous posts: Terror Atop the Train, Threat to the Dream, and Atlantic Crossing in Winter. "We had very stormy weather so that not a single person remained healthy or found any joy or pleasure on the ship. The ship flew up, then down, and made us completely dizzy....To travel over the water in winter is gruesome." The train trip went luckily and well. The trip over the ocean was very good and comfortable, but one day I felt seasick. I was picked up by people from home [Neppendorf]. Now I’m sitting in a cozy room and thinking good thoughts about my destiny and pray to God to show me how to choose. Except for a postcard he mentions sending from New York (which I don’t have), I’ve surmised this letter is Josef's first to Lisi after arriving in Cleveland because in it he summarizes his trip (strategically leaving out the "gruesome" descriptions of the sea voyage), and because she responds two weeks later, on February 12, 1911, referencing what he says here. Beer without him on Pictur. 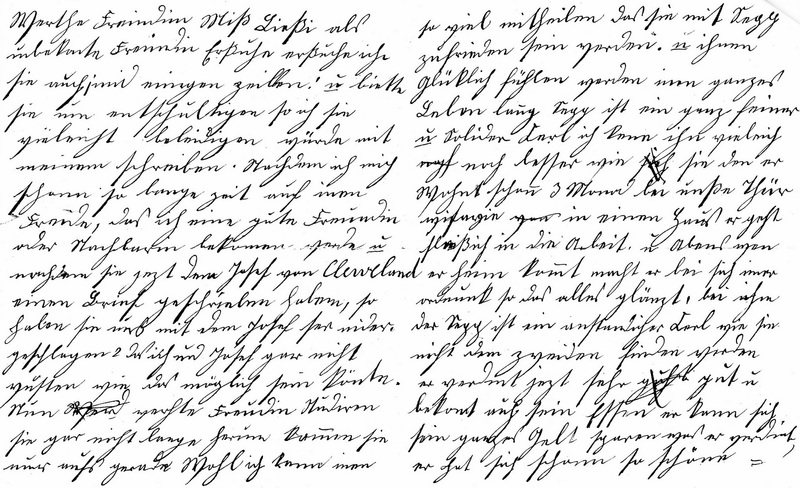 From Neppendorf, Siebenbürgen"
The letter (as well as family lore and records) indicates he's staying with Eva and Samuel Beer, a couple from his hometown of Neppendorf. Like many immigrants, my grandfather depended upon friends from "the old country" to ease his way into America. This photo, now saved for more than a century, attests to the Beer family's importance to my grandparents (I'm labeling it as my grandmother did, with her sometimes fractured grammar and spelling). 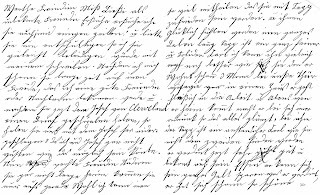 Josef continues his letter, encouraging/expecting Lisi to join him and pledging his devotion by declaring he only intends to marry once--to her. Praise God that he was always standing by me. Because of my longing for you, I got through all this. Now I want you to check into all the legalities and rules so that nothing will get in the way of our getting married quickly, because I’ll only take this step [of marriage] once. Please advise me when you are coming. I cannot pick you up [when you arrive] even though I would like to, but my boss won’t allow it at all. My boss concerns himself with money and could hire another at any time [to take my job], and you will be able to get here just as well [with other friends] as if I were there. I’m trying to decide if it’s better to look for a job in order to save some money so I won’t be obligated to anyone else because this trip cost me, including the clothes, almost everything I had saved in the last six years. Since he already has a job, (see below) I guess he's thinking of looking for another one. And six years of savings for this trip? That means he had to start planning when he was as young as fifteen! From New York I wrote you a post card and I am now waiting for your answer. 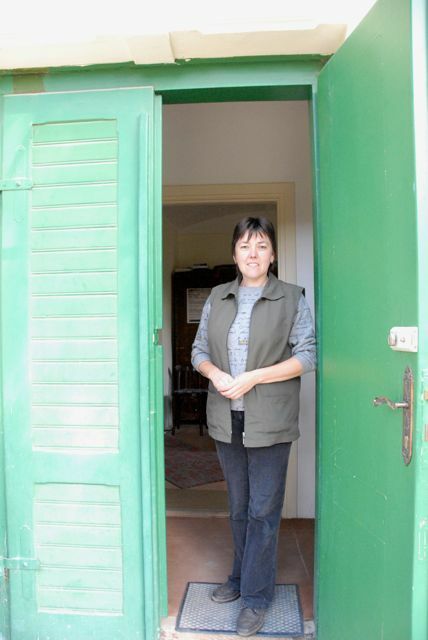 A Neppendorf woman helped me find a private home and a good job that pays well -- 60 Gulden per month. [A Gulden was the German name for the coin of the Austro-Hungarian Empire, pictured here]. It’s as I had always imagined, but didn’t believe I could really get that much. I don't know exactly what a Gulden was worth (he probably explains his wages in Guldens because Lisi will have no comprehension of a dollar's worth at this time), but many years later, my grandmother wrote that when Josef first came to America, he worked seven days a week from 5 a.m. to 7 p.m. for $7 per week, so about $30/month for 400 hours of work, or about 7.5 cents an hour! His letter shows he seems quite satisfied! And now with the best greetings and kisses from my heart, I greet you and also your brother-in-law, sister and the dear little Mitzi. Please answer quickly. I’m turning my writing now over to my friend, Frau [Mrs.] Beer. Please forgive me if I’ve offended you. Was Josef worried that he might have offended Lisi because he couldn’t pick her up when she arrived (assuming she would come right away)? Or maybe because he’s pressuring her to get whatever legalities in order so they can marry? It’s unclear, but after his sweet closing, he has Frau Beer write several paragraphs to Lisi, which he encloses in the same envelope. Perhaps Josef hoped Frau Beer would communicate with Lisi, woman-to-woman, reassuring her that coming to America was the right choice and Josef was the man for her. When you read what Mrs. Beer wrote, you may wonder, as I do, if it was a wise decision. In the next non-Travel Tuesday post, we’ll see how Mrs. Beer's words might very well have derailed Josef’s plan to lure Lisi to America. The Germans cities and churches surrounded by thick walls, behind which locals fled to escape invaders. Hence the region’s German name, Siebenbürgen (Seven Fortresses seems the best translation). The area also became known as “Saxon Land” for its large German population, and is listed so today in tourist guides.